Once it was over, the night’s importance was hard to miss. In most ways, it, like much of the last year, belonged to women. Next time someone complains about the length of the Oscars telecast, please refer them to the 2019 Grammy Awards. Clocking in at just over twenty-three years, the Grammys overstayed their welcome when we reached the two-hour mark after having seen 4,791 performances and exactly four awards presentations. The producers clearly scheduled too much. And yet, once it was over, the night’s importance was hard to miss. In most ways, it, like much of the last year, belonged to women. It is likely no accident that, in the wake of #MeToo and #TimesUp, the Grammys went with a strong female host. Alicia Keys kept things casual and enthusiastic. Unlike some awards-show hosts, she really seemed to want to be there. 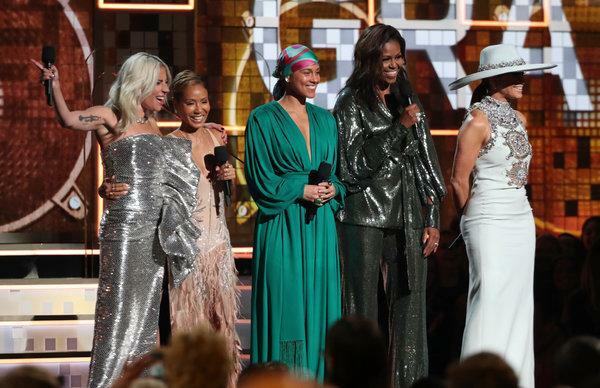 After the opening number, she brought out four of her “sisters”—Lady Gaga, Jennifer Lopez, Jada Pinkett Smith, and Michelle Obama, who received the loudest ovation of the evening. This country is starved for the kind of class and strength she effortlessly exudes, and it was clear that, despite the luminaries in the crowd, she was the night’s biggest rock star. The five powerful women in that sisterhood were only the beginning. On a night when the Grammys honored three of its longtime matriarchs—Dolly Parton, Diana Ross, and Aretha Franklin—the music industry’s new blood often shocked the world. In one of the night’s bigger upsets, Cardi B won Best Rap Album over sentimental favorite Mac Miller, who died only a few months ago. H.E.R. won Best R&B Album not long after performing onstage, and then Dua Lipa managed to one-up her by winning Best New Artist immediately after dueting with St. Vincent, a performance remarkable not only for its quality but also for its homoeroticism. Though they lost in the major televised categories, both Janelle Monet and Brandi Carlile performed and nearly stole the show from Lady Gaga. Gaga’s and Bradley Cooper’s A Star Is Born ballad “Shallow” took home Best Pop Duo or Group, and her solo rendition of the song may well have proved that she’s got the best pipes in contemporary pop. Still, you could make a case that Monet’s Prince-like stylings or Carlile’s soul-ripping version of “The Joker” might have been the best live performance of the night. It’s hard to say the same about Post Malone’s collaboration with the Red Hot Chili Peppers. Malone can sing and rap, but I spent most of his song wondering how deeply he’ll one day regret those tattoos under his eyes, and despite my love of the Chili Peppers, I must admit they had an off night. Drake’s win for Best Rap Song (“God’s Plan”) seemed overly safe, especially after Cardi B’s energetic and censor-annoying performance (see those cutaway shots during her piano dance). Overt female sexuality still freaks out America. Kacey Musgraves’s album Golden Hour won both Best Country Album and Album of the Year, the latter an upset, as I would have chosen Monet’s or Carlile’s record. It’s not a robbery, though. Country music seems like it’s in pretty good hands if this year’s winning and nominated artists are any indication. If women ruled, the men weren’t shut out. Along with Drake’s aforementioned win, Childish Gambino’s “This Is America” was honored as both Song of the Year and Record of the Year. No song deserved it more. If you haven’t listened to Donald Glover’s track and watched its incendiary video, run to the nearest computer and look it up. That song plays louder than any assault, any chauvinism, any tweet from the White House. And it’s only getting louder. Turn it up and listen. It’s one hell of a tune.